Participate in the development of Best Management Practices regarding sage-grouse and power lines. At the fall 2012 APLIC meeting in Great Falls, MT, a one-day sage-grouse workshop was held. This led to a multi-year effort among APLIC-member utilities, the U.S. Fish and Wildlife Service, Bureau of Land Management, and state wildlife agencies throughout sage-grouse range to develop Best Management Practices for electric utilities in sage-grouse areas. These BMPs were released in 2015 (see SAGR-BMP-FINALJune-2015.pdf). 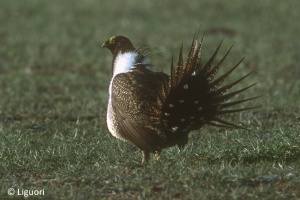 In 2010, Utah State University, Utah Wildlife in Need, Rocky Mountain Power, and the Utah Division of Wildlife Resources released a comprehensive literature review of sage-grouse and tall structures. An overview of this effort and an updated literature were recently published by Messmer et al. (2013) in Human-Wildlife Interactions (see http://www.berrymaninstitute.org/htm/human-wildlife-interactions-journal). This issue of the journal includes many other sage-grouse papers. In June 2011, Utah Wildlife in Need (UWIN) released research protocols to assess the impacts of tall structures on sage-grouse. This effort was a partnership among UWIN, Utah State University, Utah Division of Wildlife Resources, Rocky Mountain Power, Northwestern Energy, Idaho Power Company and APLIC, and numerous sage-grouse experts participated in the development of this document.